Editor: Ganjihʼī, Riz̤ā, 1911 or 1912-1995 or 1996. "The Library of Congress announced today that it is making 25 million records in its online catalog available for free bulk download at loc.gov/cds/products/marcDist.php. This is the largest release of digital records in the Library’s history. The records also will be easily accessible at data.gov, the open-government website hosted by the General Services Administration (GSA). Until now, these bibliographic records have only been available individually or through a paid subscription." Edited by: Ṭāhir, Muḥammad ʻAlī. 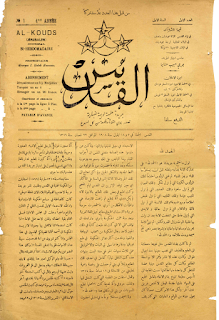 "Published from October 1924 to August 1931, when Egyptian authorities acting on behalf of the British colonial administration cancelled its license, the “Ashoura” newspaper, which means “consultation” in Arabic, became the flagship of Eltaher’s national and intellectual activism, whence his office came to be called “Dar Ashoura”, or Ashoura House. Two issues of “Ashoura” were published under a completely different name, possibly following a short ban on the newspaper. On March 26 and April 5, 1928 “Ashoura” appeared under the name “Al-Nas” (The people), with a license belonging to the Egyptian journalist Hussein Shafiq Al-Masri." "The “Ashoura” newspaper license was suspended by the Government of Egypt from August 1931 until January 1937. That same year Dr. Mahmoud Azmi, offered his newspaper, “Al-Shabab”, i.e. Youth, to Eltaher free of charge “... so that he could resume publishing his nationalist views”. Eltaher published “Al-Shabab” from February 1937 until April 1939 when its license was again suspended by Egyptian authorities acting on behalf of the British colonial administration." "After “Al-Shabab” was suspended, the Egyptian journalist Abdelqader El-Toumi offered his newspaper, “Al-Alam Al-Masri”, i.e. The Egyptian Flag, to Eltaher free of charge so that he could resume publishing his nationalist views. “Al-Alam Al-Masri” was published from April 1939 until August 1939, when Eltaher stopped publishing it on the eve of World War II and the imposition of emergency measures in Egypt. In 1953 the Government of Egypt under General Mohamed Naguib reinstated the publication license of “Ashoura”, but the Ministry of the Interior, which was under Colonel Gamal Abdel-Nasser, who was also Deputy Prime Minister, still prohibited Eltaher from publishing it. He never published any newspaper after that." This volume offers the first critical edition of the Arabic translation of Galen's Commentary on Book 2 of the Hippocratic Epidemics. It follows the edition of Galen's Commentary on Book 1 published previously in this series. The Arabic text is accompanied by an English translation and extensive indices. The introduction outlines the history of the Greek and Arabic text and discusses the authorship, dating, and style of the Arabic translation. Edited by Cahan, Jean Axelrad. Published: London ; New York, NY : Anthem Press, 2016. Published : Berlin, [Germany] ; Boston, [Massachusetts] : De Gruyter, 2016.